American V8 muscle should be affordable. 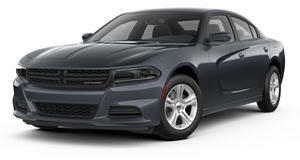 The Dodge Charger as we know it today returned to the market after a long absence in 2006. No longer a coupe, it’s since remained a four door sedan while the Challenger caters to those who don’t require an extra pair of doors. That works out splendidly for the gearhead with a family but who’s in need of American V8 muscle for a decent price. There’s only one issue, however: a lot of people own Chargers, even those equipped with the optional 6.1-liter Hemi V8 with 425 hp and 420 lb-ft of torque. Of course many owners want their cars to stand out, and Wiked Kustomz of Sacramento, California, is ready to assist. We recently caught up with the crew of Wiked Kustomz and checked out one of its recent projects, a 2007 Charger SRT. Featuring AG forged wheels in Toyo Tires, custom exhaust, an AccuAir E-level suspension, Viair compressors, Diode Dynamics HIDs, a Black Ops Auto Works splitter and rear diffuser, the entire modification process took about two weeks to complete. Wiked Kustomz also told us it modifies about 200 cars a years, typically collaborating with the customer regarding his or her final goal. How much does work like this cost? Well, it’s really quite a range. It can be as low as $800 or upwards of $35,000 for a complete rebuild. Really, it all depends on what the customer wants and how much they can afford. But we happen to think this modestly modified 2007 Charger SRT is done just right. Special thanks to Wiked Kustomz for letting us film the car.